Stop whatever you are doing right now and grab your calendar. 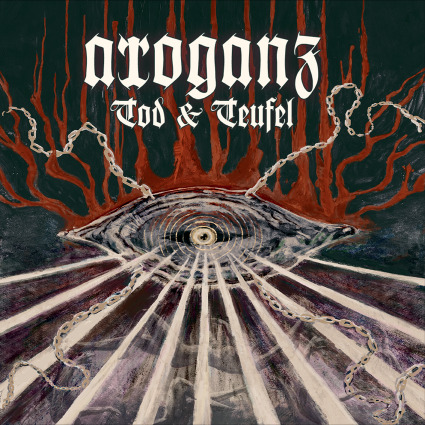 Set aside about and two hours of your free day: one to listen to Arroganz's magnificent third studio release, Tod & Teufel, and another one to get your head back in place. Although this German horde takes pride in the brutality of its Death Metal, it is the Atmospheric Black Metal feel that hover above the entire work that ties this album together. In fact, the tracks pieces so well together that I would not be surprised if this were a conceptual album. Most tracks follow a theme-variation structure, which not keeps the the riff-heavy pieces (which are few, for modern standards) coherent , but also reinforces the somber atmosphere. The album opens with i.d.t.m, which introduces the crunchy timbres and half-step bends that permeate the following tracks. One Death then creates momentum by speeding up, finally exploding in the following Arisen From Failure, Perished As King. Ironically, Tod & Teufel - chaotic and with many blast beats - strikes me as the most atypical work in the album. Demons Heart, characterized by marked down beats, and strong riffs, pulls you back to a dark descending path, to the dragging, agonizing Intoxication. All Light Is a Lie becomes the apex of the album by cleverly playing around the added sharp fourth in a Gm blues pentatonic scale. At this point, the album had captured me to the point that I had to replay the track and try to play over it, just to relieve some of my anxiety. The next two tracks, Black Aura, and Guilty, keep the momentum towards the Burzum-esque closing piece, Alles. Tod & Teufel was the perfect soundtrack for a cloudy Philadelphia day. It is a heavy, emotional, and raw album that is sure to keep dropping jaws for decades to come.